Dealing with emotions in a Divorce or Separation. It goes without saying that you shouldn’t deliver the news over the phone or via email, voicemail, SMS, Twitter or Facebook. Telling your spouse you want a divorce is likely to be one of the most difficult conversations you’re ever likely to have. Marriage is one of life’s central relationships and, for many people, seeking a divorce feels like a tremendous failure. It is tough to initiate something you know will have great emotional, practical and financial implications for yourself and your children. Whatever you do, please don’t let your spouse be the last to know. If you have been contemplating divorce for a while and have talked to friends or family members about it, make sure you follow up with your spouse immediately. Don’t let your spouse hear from someone else that you are planning to leave him/her. Though you can control how you carry yourself in a divorce, you cannot control your spouse’s reaction. Sometimes the news that you want a divorce comes as a surprise, and sometimes not. People are often frightened to admit their unhappiness and so don’t reveal that they too are at the end of their rope. Others, no matter how clear the signals that you were miserable, are in such denial that they cannot hear you or understand why you would want to leave. So listen to your spouse. Most people have great difficulty doing this. It is sometimes extremely hard to be empathic if you can’t stand each other anymore. Don’t argue in a way that puts your spouse on the defensive. Acknowledge their and your own feelings of sadness or shame, but remain firm in your intent. Having a healthy divorce is as important as having a healthy marriage. Think of it in terms of a business relationship. Your divorce is a business deal. Treating each other with decency and respect will take a lot less energy and will occupy less negative emotional space in your head than aggressively attacking each other. If there has been a history of aggression or violence in your relationship, have this talk in a public place. When people are very distraught, they do things they wouldn’t do normally. Only if you are absolutely certain that your spouse will not become aggressive or abusive will it be in your favour to approach the subject in privacy. Most spouses agree on temporary living arrangements during the divorce, putting off final decisions until the divorce process has been finalised. What if you can't agree? In most cases, neither spouse is more entitled to stay in the family home than the other. In families with children, it is common for the primary caregiver to stay in the house with them; often, but not always, that person is the mother. If you intend to share parenting, then the closer the parent of alternate residence lives, the better for the children, as there will be less disruption to their school and social lives. Make every effort you can to keep the households near each other. No matter how anxious you are to get out of the house, if you go without your children, the message you’ll be sending is that you think your spouse is a better parent, who can take better care of your children. Also, a court doesn’t like to disturb the status quo. So wherever your children go when you separate, that’s likely where they will stay post divorce. If you are worried that moving out might lessen your chances of getting a proper parenting plan implemented, rather meet with your spouse and agree on an interim parenting plan pending divorce. If you and your children are in physical danger from your spouse, you can get a protection order. Get out of the house quickly, taking your children with you, and lodge a rule 43 application straightaway for interim care, contact and maintenance, or go to court and get a restraining order, coupled with an application for emergency monetary relief pending divorce. If you stay in the family home, change the locks after you get the court order. A separation or divorce launches everyone involved into unfamiliar territory. Everything is disrupted, your responsibilities and routine, your home, your relationships with extended family and friends, and even your own identity. A divorce brings uncertainty about your future. What will life be like without your spouse? Will you find someone else? Will you end up alone? These unknowns often seem worse than the prospect of staying in an unhappy relationship. Healing from a divorce is difficult, but it’s important to know and to keep reminding yourself that you can and will move on. Healing takes time, so be patient with yourself. Some experts say it may take up to two years to heal from a divorce, some say three. The healing process is different for everyone. Grief is a natural reaction to loss, and divorce involves multiple losses. Loss of companionship and shared experiences, loss of support, be it financial, intellectual, social or emotional, and loss of hopes, plans and dreams. There are five basic emotional stages that you will encounter during a divorce. These are very similar to the five stages of grief and you will need to go through them if you want to heal. Denial is the initial period of not accepting the reality of the divorce. It is a natural defense that allows you enough time to admit what is happening. Things will feel unreal during this initial phase. You may think that it is a bluff or some kind of misunderstanding, and you will simply not believe what is happening. More often than not, we fool ourselves into thinking it’s only a rough patch; that our partner will come to his/her senses soon. Do not get stuck in this phase forever. Once reality sets in, emotions start to boil. You may feel angry about being let down. You have been hurt in a way that you could not imagine. Finding an acceptable way to express your anger is a fundamental part of the healing process. Anger is normal in a divorce. What you do with your anger is the key. Remember, if you have children, you are their role model; they will emulate what they see you doing. Anger manifests in different ways: short-lived rage, simmering resentment, prolonged bitterness. Your anger might not be directed at your spouse, but at yourself or others involved in the divorce process. Anger can be self-destructive and self-defeating, and it may be hard to think clearly in this stage. Being able to let go of the anger will help you to heal. Once the anger fades, it is replaced with a phase of extreme insecurity and panic. Bargaining is the period of wanting to fix things that are beyond your control. It is rethinking your decision to divorce. You might say something like, ‘if only I had done such and such’. You might feel guilt for what has happened and blame yourself. Depression occurs when the reality of the divorce and the associated loss sets in. You may question your ability to deal with your sadness and turn to unhealthy coping devices to ease your pain; overeating, not sleeping, excessive alcohol consumption, etc. Instead, you need to look after yourself and find healthy ways to overcome your sadness. Acceptance is the final stage. Change is no longer a threat; it may even be welcome. Depending on your circumstances, you might be more accepting of your new situation and more optimistic about your future. In any case, you have lived through and survived a difficult time. It has passed and life goes on. You and your spouse may be in different emotional stages at different times, or you may experience the stages in a different order. The main thing is that you go through and deal with all of them. It is completely normal to feel many conflicting emotions, including anger, resentment, fear, sadness, relief and confusion. Identify and acknowledge these feelings. They will be painful, but trying to suppress or ignore them will only extend the grieving process. Feel these feelings but don’t dwell on the negative or over analyse the situation too much. Dwelling on wounding feelings like blame, anger and resentment will rob you of valuable energy and it will prevent you from healing. Talk about your feelings with others. Knowing that they are aware of your frame of mind will make you feel less alone and will help you to heal. Conveying your emotions will liberate you in a way. When you commit to another person, you create various hopes and dreams. Sometimes it is difficult to let these dreams go. As you grieve the loss of the future you once imagined, be encouraged by the fact that new hopes and dreams will eventually replace your old ones. The breakup of a marriage is like a death, so it is completely natural to mourn the life and lifestyle you have lost, even if you wanted the split. Grief has the ability to paralyse you after a breakup, but after a while, the sadness begins to lift. Day by day, and little by little, you will start to live again. But if you do not feel any forward momentum, it may well be that you are suffering from depression. Friends who will let you sob on their shoulder and sleep on their couch when you can’t handle being alone are gems. But to kick-start your new life, it is always better to talk with a therapist. One of the most important things you can do is establish a support system for yourself. If there is a silver lining to the fact that half of marriages currently end in divorce, it’s that there is more support for individuals going through this transition. Support from others is critical. Reach out to trusted friends and family members. Rely on close friends to prevent you from doing anything irrational, like calling your ex late at night after a few glasses of wine or posting nasty things on Facebook or harassing his/her new partner. People who have been through a painful divorce themselves can be particularly helpful. They know what it is like and may assist you in the healing process. Surround yourself with people who are positive and who you can talk to without having to worry about being judged, criticised or told what to do. The ‘we’ does not exist anymore, so you need to connect with your individual identity. If you feel like you have lost your social network along with the divorce, make an effort to meet new people. After your divorce, you may feel like the odd one out in a paired-up world. In fact, your married friends may not want to spend as much time with you as they did in the past because you are swimming in a different social pool now, so surround yourself with similar people. Spending time with and meeting new people means less time spent on those painful memories and feelings. The more time you invest in ex bashing, the less time you will have to work on what is possible. People do need to vent, and it is an important part of the healing process, but avoid people who keep recycling that. One of the hardest parts of any divorce is telling the children. It is important that you tell them together about the divorce. It sends a clear message to your children that you are both capable of working together for their benefit. In addition, you have to tell all of the children at once so that each child hears the news directly from Mom and Dad and not from a sibling who heard it first. Let them understand that it was an adult decision; children need lots of reassurance that the divorce is not their fault. 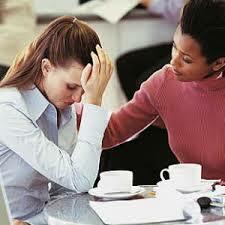 Reassure them that you are available and that you will always be there for them. Collectively and individually convey your unconditional love through words and actions. Make it clear to them that parents don’t divorce children. If your children are of different ages, do follow-ups with the older children in separate conversations. The manner in which you break the news will affect the degree of their anxiety. Don’t let the meeting become a screaming match; the news will be difficult enough for them to handle so don’t cloud things further. Avoid the tendency to assign blame and try to incorporate the word ‘we’ when you’re explaining the decisions that have been made. Let your children express their feelings. It is a fact that most parents only spend one and a half minutes per day actively listening to their children. Most of the time is spent giving instructions: ‘keep quiet’, ‘brush your teeth’, ‘comb your hair’, ‘get into bed’ and so on. Become active listeners and allow your children the time and freedom to express their own feelings. Never try to win or lobby support from your children. Your children may try to be your friend out of fear of rejection, but in the end it will only confuse them. Children need to know that they can turn to you for support, not the other way around. It is not important that you provide specific details about why you are planning a divorce, but your children may want to know why. Older children will know that this is a huge life change, and they may weigh that change against the reasons you give them. So be prepared to give some type of general explanation. Your children will want to know where they will be living in future and with which parent, and what about their lives is going to change, so be honest about what you know and what you don’t know. The more detail you give to your children about where the departing parent will be living and when they will be seeing him/her, the better. They need to know that they will be able to maintain a quality relationship with both parents. You can divorce your spouse, but not your family. There are rules parents can follow that will make their lives easier post-divorce. It is extremely important for both parents to create what is called a ‘healthy post-divorce family’. Realise that you may be completely out of sync with the each other. It may take months if not years for one of you to adjust to the reality of the divorce. It is not unusual for the parent who was considering divorce for a long time to be ready to move on quicker than the parent who may have been taken by surprise and is grieving the loss of the relationship. For the sake of your children, be respectful of these differences. Don’t rush introducing a new partner. It’s vital that you keep new partners out of the picture for a while. The children must adapt first to the loss they have experienced. Treat each other like business partners and give each other the respect that the position of parent demands. Many divorced couples treat their employees with more respect than they treat their exes. Yet, the job that has been entrusted to that person is far more important than any other in your life. Share requests and communicate openly with each other. Let the children see that you communicate openly. Listen attentively to your children when they speak to you. Encourage them to speak about their own concerns. Don’t criticise each other. Children don’t need to be privy to adult conversations, and they don’t want to hear personal details about your relationship with their father/mother. Don’t tell your children all of the unpleasant details of your divorce. Even if your ex was unfaithful. In the end, you may come to understand that you also contributed to the disintegration or your relationship. Feeding your children only one side of the story is misleading and immensely destructive. It is unfair to place your children in a position of having to side with one parent or the other. Provide your children with routine, consistency and dependability. Limit familial conflict at all costs. It is one of the most damaging things you can do to your children. Never criticise each other in front of your children. Children see themselves as extensions of their parents, and so they will feel like you are criticising them.